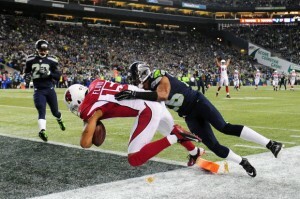 On Sunday night, Nov. 15, 2015 the Arizona Cardinals defeated the Seattle Seahawks by a final score of 39-32. In winning this game against their division rival, Arizona improved to a record of 7-2 while dropping the Seahawks to 4-5 and putting the playoff hopes of the latter in serious jeopardy. This capped off the tenth weekend of NFL football in the 2015 season. Earlier in the day, Denver Broncos quarterback Peyton Manning became the NFL‘s all-time leader in career passing yardage though his team lost to the Kansas City Chiefs. Also, Minnesota Vikings running back Adrian Peterson eclipsed the 200 yard mark for the sixth time in his NFL career. Click here for the complete recap of all the games including stats and photos. This entry was posted in NFL and tagged arizona cardinals, new england patriots, nfl, peyton manning record yardage, pittsburgh steelers. Bookmark the permalink.